Holiday Evening at Edison State is both a celebration and a commitment. With the generous support of event sponsors, Edison State brings world-class entertainers to our campus to celebrate the winter holiday season. Proceeds from the event directly support the General Scholarship Fund and assist recent graduates and those returning to school… to begin, change or advance their careers. 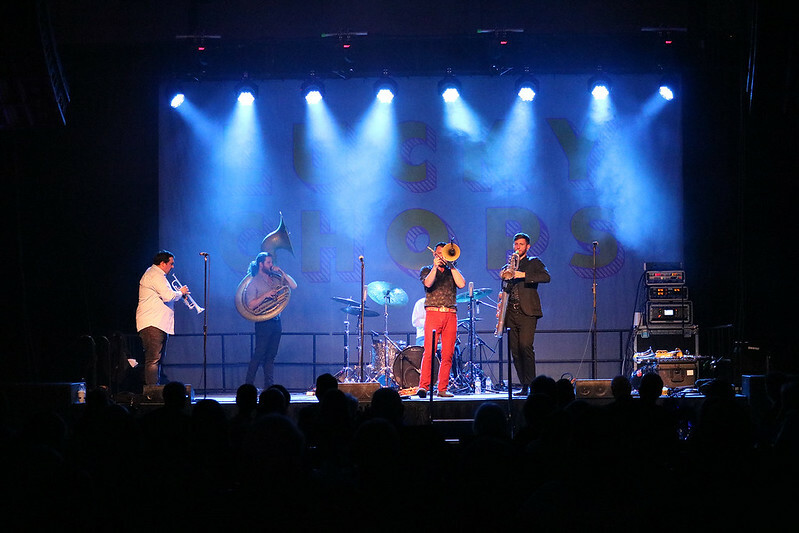 The 21st Annual Holiday Evening at Edison State featured Lucky Chops, a five member brass band from New York City, who has been unleashing their high-energy funk on the world since their formation in 2006. The intensity of the band's energy is fueled by their desire to share the healing and inspirational power of music with others. Lucky Chops maintains a busy schedule touring across several continents and is committed to music education, regularly performing clinics and educational outreaches to help train and inspire the next generation of musicians. An additional component to this year's Holiday Evening at Edison State was two Edison State Music Education Clinics conducted by Lucky Chops for local junior and high school jazz band members on Thursday, November 29. These clinics were made possible and are sponsored by the Miami County Foundation and The Piqua Community Foundation and The Edison Foundation. For more information about Holiday Evening at Edison State or the Music Education Clinics, please email Julie Slattery or call 937.778.7805. You can become a vital leader in continuing the Holiday Evening at Edison State tradition through its second decade by becoming a sponsor. If you would like more information, or would like to be added to the Holiday Evening at Edison State mailing list, please contact The Edison Foundation. Feel free to browse photo albums from the 2018 Holiday Evening at Edison State. Click here to view a full video and photos of the Music Education Clinics.